Everything about this set suggests that it has been treasured. The pen and pencil are in wonderful condition and the box is pristine. The little I know about Parker 51s includes that the Aerometrics had a long production run, from 1950 to 1969. At its last possible date of production, then, this set is 43 years old. In all probability it’s older. I know a few forty-three-year-olds and none of them look as good as this! ← Waterman No 14 Eyedropper Filler. The Parker 51 Vacumatic was introduced in 1941 in the US (this was the pen that the Allies provided to the German high command to sign the instrument of surrender in May 1945). 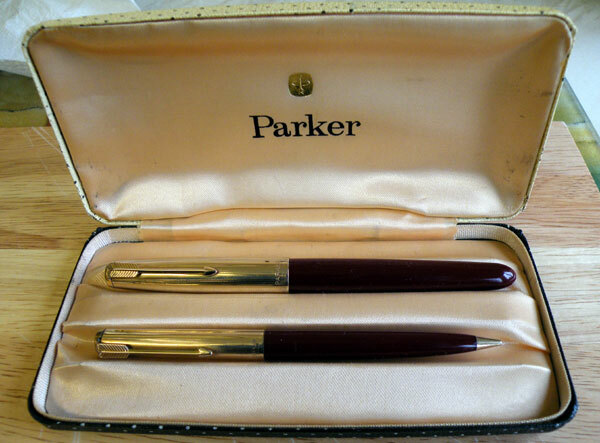 The Parker 51 Aerometric was introduced in 1948 and production ceased (after a several updates) in 1972 in the USA and around 1978 in the UK. Get a copy of the Parker 51 book by David and Mark Shepherd.